Cold weather is a reminder to make your backyard inviting for birds overwintering in your area.With some simple preparations you can have birds visiting throughout the winter and create a safe spot for them to eat, get water, and even bathe when its needed. In the summer there is plenty of natural food available for birds, including insects, berries and other fruits. Although many birds migrate south for the winter, the birds that stay north need to adapt to their changing food supply. Sparrows, for example, switch from a protein-packed insect diet to eating mostly seeds. Winter is a hard time for many birds, and they are more likely to turn to bird feeders as a food source. Here are a few things you can do to your yard to make it a home for overwintering birds. Bird feeders — Putting out feeders is a logical start, but here are a few tips which will mean a lot to the birds visiting those feeders. Place your bird feeders near natural vegetation, such as thick shrubs or a hedge, so that birds at your feeders can quickly find cover from predators. Be careful about windows — if birds flying away from the bird feeder (maybe escaping a hawk) run into a window by your house they could be injured or even killed. You can solve this by either placing the feeders very far away from windows, or by keeping them so close to the windows (within a few feet) that the birds are unable to get enough speed to actually hurt themselves if they hit them. There are many different types of bird feeders and lots of different seeds available. If you provide several types of seeds and feeders, you will attract a variety of different species of birds. If you’re looking for a basic bird feeder, a good choice is one that dispenses thistle. This will attract beautiful winter finches, such as Common Redpolls and American Goldfinches. Fresh Open Water — When temperatures drop, water freezes and birds can dehydrate in the dry, cold air. Then, generally the only liquids available have chemicals in them that keep them from freezing and these are more than likely hazardous for birds drinking them. You can provide fresh water in a heated birdbath. The heating element keeps the water temperature just above freezing and is a really important component of your backyard bird feeding array. If you don’t have outside electrical, then get one of the solar powered bird baths. No matter which one you get, change the water regularly to keep it clean and disease free. Plus in winter, between evaporation and birds splashing water for much needed baths, you may need to top it up often as this water source may be the most visited spot in your yard. 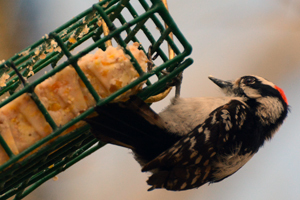 Suet — There are many forms of suet, but all of them are fatty and contain lots of energy. Because suet is made of beef fat, it becomes rancid in warm temperatures and should only be offered to birds in cold weather. Suet can be embedded with lots of yummy treats, including seeds, berries and bread crumbs. Some suet includes grit, such as sand, which aids in bird digestion. You can even make your own suet! Here is a recipe, but you can get creative about the different treats you include. Suet is attractive to chickadees, woodpeckers and nuthatches. The energy from the fat helps keep them warm in cold temperatures and suet balls or feeders are regularly visited. Brush piles — Many people clean these up as part of a fall cleanup, but the best thing for birds is to leave them! Birds, especially sparrows, love brush piles. Gather leaves and sticks from your yard and pile them up outside a window where you can see it clearly from inside. Sprinkle seeds over and under the pile. Sparrows will jump in, out and around the pile in search of seeds, and the brush pile itself provides a comfortable shelter from predators and often can block cold winter blasts for small birds. With just a little bit of work your yard could be packed with birds this winter. Keep your feeders stocked and an open water source since many birds will likely depend on them. If you set up your feeders, brush piles and suet in front of a window you can enjoy winter birding from the comfort of your favorite chair all winter.